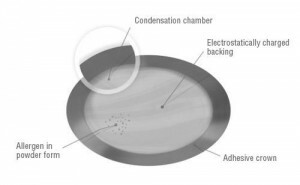 After having started off with research into peanut, house dust mite and cows’ milk protein allergies, this French company has moved into new territory, with the development of the Viaskin egg adhesive patch. The patch, (pictured below), is applied to the patient’s skin and may be used with any age demographic, including children. This gives it real potential to offer an alternative to painful or difficult-to-administer children’s allergy treatments such as injections and drops or tablets. The Viaskin patch approach centres around the very gradual application of minute quantities of an allergen, initially in powder form, then solubilized, via the skin. Over time, this has a ‘tolerizing’ or ‘desensitizing’ effect on the body’s immune system with regard to the offending antigens. Key to the success of the patch is its electrostatically-charged backing. This ensures the electrically-charged spray of allergens from the electrospray covers the backing in a perfectly even layer of protein compounds.